On the face of it, Friday’s jobs report was terrible. The headline number missed terribly with just 38,000 jobs added to the economy against expectations of 160,000. It was the fewest number of jobs added since 2010. Even with the drop in the basic unemployment rate and possible short-term effects holding the headline number down, there wasn’t much good to be found under the hood either. The report’s sorry state even got some analysts chattering about a recession. In a classic case of “Everyone take a deep breath”, however, many analysts on Monday started to look at the report as an encouraging sign rather than a harbinger of doom. The idea from this bullish camp is that the slowdown in the pace of hiring is only natural as the economy hits full employment. 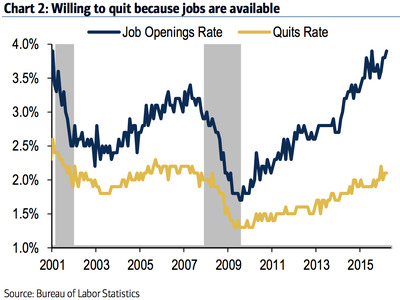 Basically, there aren’t many jobs added because there aren’t as many people in need of a job. 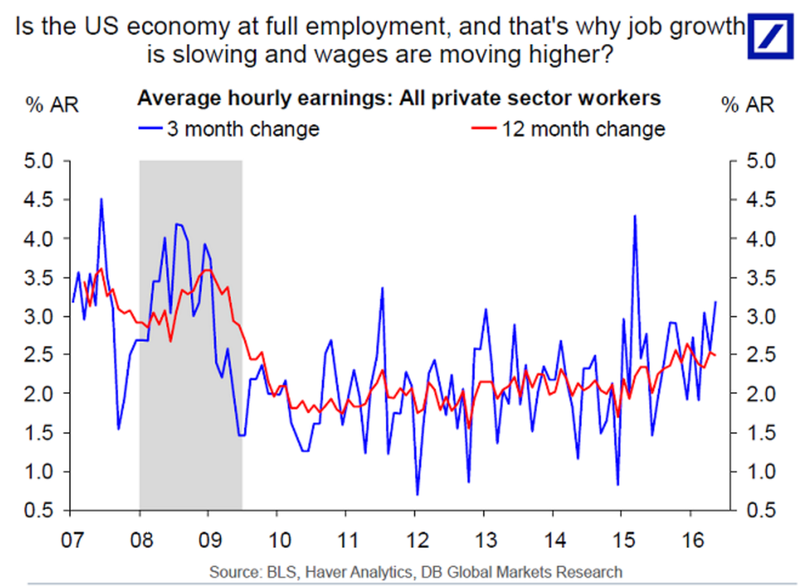 “Most measures of labour market slack are at levels consistent with the last time the economy reached full employment in 2005,” wrote Ethan Harris, global economist at Bank of America Merrill Lynch in a note to clients. Harris noted a number of measures that would indicate the full employment narrative: increasing wage growth, workers voluntary quitting their jobs, and fewer workers per available job opening. 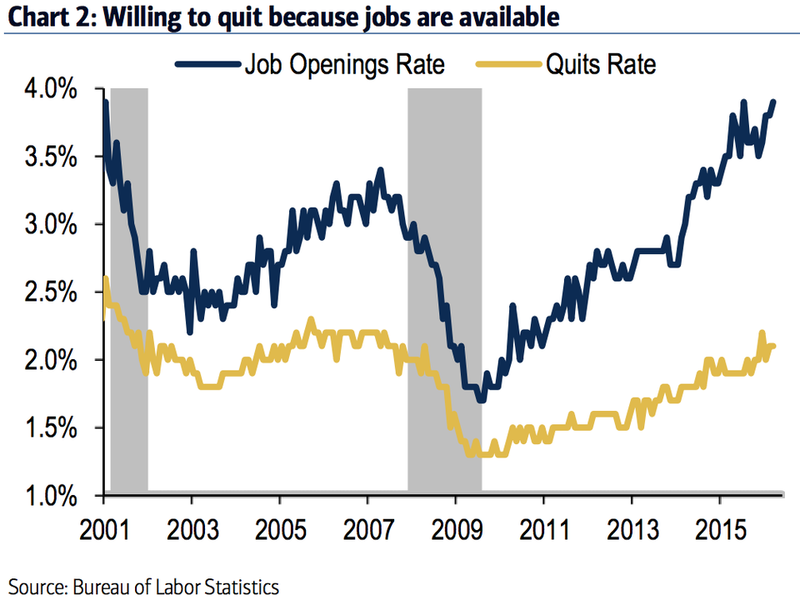 In a normal labour market, workers are willing to quit their job to look for a new one, there are plenty of job openings and workers feel reasonably confident about the availability of jobs. By all of these metrics the labour market is at least as healthy as in 2005. The quit rate is right at its 2005 level and the job opening rate is not only higher than in 2005, but well above its previous peak. The labour market differential — the share of workers who see jobs as plentiful minus those seeing them as hard to get — is back to zero. Again, this is slightly better than in 2005. Torsten Sløk, chief international economist at Deutsche Bank, highlighted wage growth as the biggest argument for full employment. “Another interpretation of the employment report is that the economy is very close to full employment,” wrote Sløk in a note to clients. On Friday, Sløk’s colleague at Deutsche Bank, David Bianco also noted that the recent trends for all non-jobs report labour market numbers were strong and did not point to any sort of recession. So perhaps it’s not that the whole economic structure is falling apart, but rather it’s run out of room to grow.